A story about a teenage girl whose life has become a living hell because of her alcoholic father. Her mother seems to love her little brother better than her and she feels a lot of pressure because of the circumstances of her family. She's definitely more grown-up than the rest of the girls in her class. She lately feels some sort of connection with one of the bad guys in school, who has been showing kindness to her younger brother lately. He takes both of them to the zoo after the father breaks his promise due to being hungover. 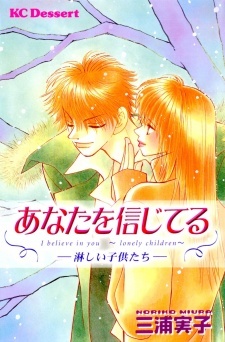 This is my first review, but I really wanted to give a review to this wonderful manga! I at first, wasn't sure rather I would like it or not, but I really began to love it more as I read chapter two. The art wasn't the best as it could be, but I looked past it. It bugged me sometimes, but there's more to manga that just the artwork. The story started great and ended great as well. Some good character points, like how Seri developed in the end, but nothing else. But to sum it up, I would recommend this to anyone that loves deep stories of people struggling in life. This manga was absolutely outstanding for only 2 chapters! Since I rate all my anime and manga soley on personal enjoyment, I rated this a 10, but if I had to go into other fields like character or artwork, that would be completely different. The characters through-out the story are greatly developed and you learn about their backround and where they come from. Since the topic the storyline follows is quite touchy, you tend to sympathize towards the characters more. I for one knew that Satoru Yashima and Seri Takano would be one of my OTP's since the very beginning to to the artwork, and this is what'll be explained next. The artwork for me was very dull and boring. I rated this about a 5, due to the fact that it was sometimes even hard for me to distinguish between characters. Thankfully Satoru's hair was darker than the rest of the characters, so I could recognize him right away.